HomeComic NotesGet Avenging Spider-Man #1 With The Digital Download Code! Get Avenging Spider-Man #1 With The Digital Download Code! 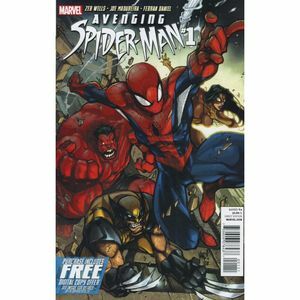 Avenging Spider-Man #1 is now available from Forbidden Planet!Â With it you get the digital redemption code too! Orders for this item must be placedÂ before 10 November 2011. The return of legendary artist Joe Madureira (X-Men, Battle Chasers) and fan-favorite Spidey writer Zeb Wells in a brand new, highly anticipated, monthly Spider-series that teams the wall-crawler up with some of the greatest heroes in the Marvel Universe. In our first issue, Spider-Man and Red Hulk take on a Moloid army during the New York Marathon! Stay safe until November because you’ll want to be here!